Changzhou Hongli Weighing Equipment Co., Ltd., a high-tech enterprise specializing in research, development, manufacture and sales of electronic weighing instrument, has a batch of professionals in electronic weighing instrument. It occupies a place in the industry relying on its advanced technologies, innovated and precise design, superior production equipment as well as complete testing system. Especially the “Small Platform Scale” independently developed and produced by Hongli has won some popularity in the weighing apparatus industry, and is regarded as the “expert of small platform scale”, which attracts customers to come in a continuous stream from the home and abroad. Speaking of the past, Shen Lixin, General Manager of Changzhou Hongli, was filled with pride. Changzhou Hongli obtained the business license on November 20, 2003, and participated in the weighing apparatus exhibition held in Lianyungang in 2004 with exhibited products including platform weighing scales and electronic scales. 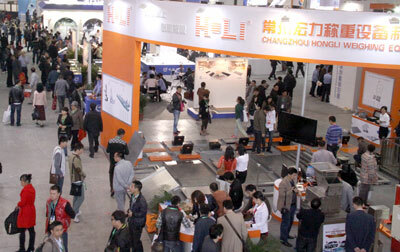 Hongli applies for 24 booths this year, and brings 4 small platform scale. It has as many as 7 types of new products this year, among which, the plastic flat scales are the first in the country. Among the new products, there is a high-precision packing scale with the efficiency of 1200 packages/hour, which is mainly applied to industries of chemical fertilizer and beverage. Hongli today has a complete network of sales and service, and established a whole set of service supervising system. Therefore, Changzhou Hongli today is not wonderful only for its “small platform scale”.